If there's one thing I recommend purchasing for the fall and winter months (besides a great jacket, preferably navy, and a nice pair of boots), it has to be a sweater dress. I purchased this dress when I was shopping with my friend (we both snatched one actually, haha) and we are so happy we did. It really can be worn for any occasion. Dress it up with a pair of burgundy tights and riding boots for Thanksgiving, with ballet flats and a blazer for brunch, or dress it down completely with a pair of tennies and a quilted vest. This dress has such a unique yet classic look and is super warm, so it's perfect to wear all season long. I never would have thought I would be wearing a dress so much this fall, but am so excited to put this one to use! Are you into dresses for fall? I love that dress paired with those booties! So, so cute Caroline! 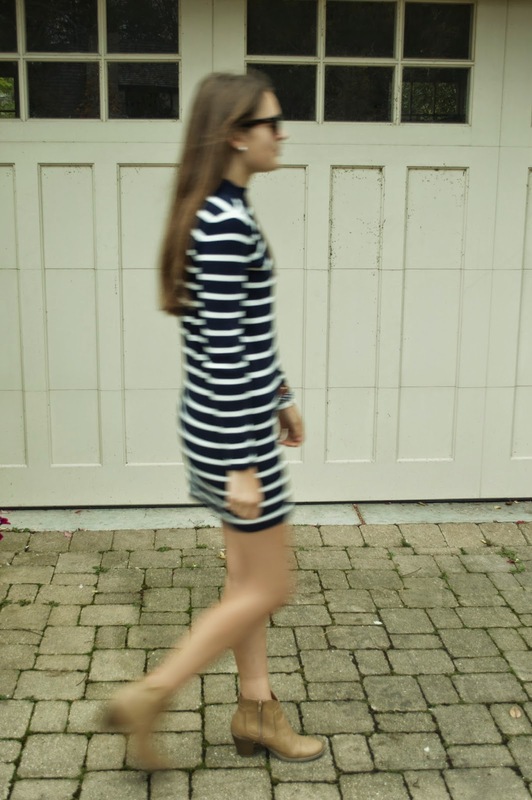 And I agree, sweater dresses are a fall + winter must have! I completely agree-- a great fall dress is essential! 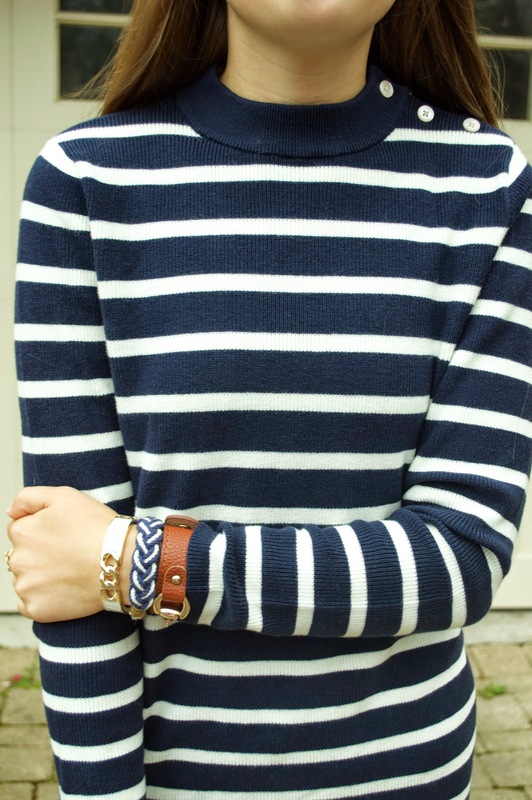 Love the stripes! I need that dress is my closet right now! 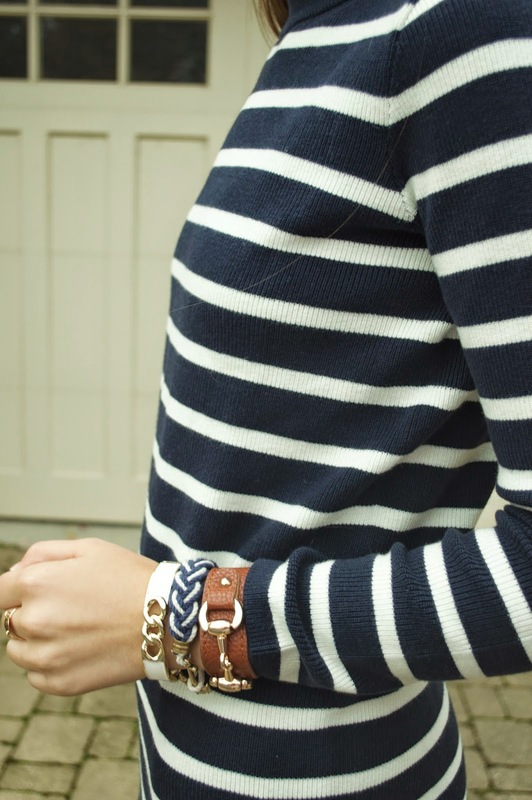 One of my favorite outfits yet-- simple and classic! Those boots, wow, just wow combined with that dress. Great outfit! You look so pretty, I love that you paired the dress with booties... perfect for fall!